Moore Books :: Caving :: UK Caving Books (general interest) :: [USED] A Pictorial Guide Gough's Caves, Cheddar. Caving UK Caving Books (general interest) [USED] A Pictorial Guide Gough's Caves, Cheddar. 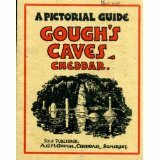 [USED] A Pictorial Guide Gough's Caves, Cheddar.